FIND YOUR WAY BACK TO IT! Once you've parked your car, either from inside or while standing just outside your car, Open the BOSTON LOCAL (The Boston Directory) Car Finder. With your mobile device's GPS activated, simply 'pin' your vehicle's location (TAG IT) on the GPS map. You've now tagged on your vehicle's location. This feature is being touted as a new 'Convenience Feature' in certain new cars. Not only has this been a feature in BOSTON LOCAL since 2012, but also, with BOSTON LOCAL, this works with any vehicle and vehicle type anywhere in the U.S. It Doesn't Have To Be A Car, Bike, Scooter or Other Vehicle! A package, a shipment; your keys; virtually any stationary object or object you 'expect' to be stationary until you return. At your option, you may also snap a photo of your parked car. There are many reasons you may wish to SNAP IT; like documenting visual proximity; the condition of your vehicle when parked, or showing that the parking meter reads 1:22.00 remaining. It works with any vehicle located anywhere in the United States so you may even wish to share this convenience with your family, friends, networks and other 'social connections'. Share it especially with those you know who just can't seem to locate their vehicle in the shopping mall parking lot. Go ahead... SNAP IT. How about a way to track specific items stored in stock. 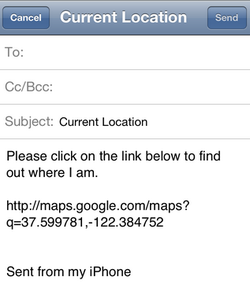 Simply TAG IT , then send the coordinates to yourself and your staff. With their GPS-activated mobile device they'll located it quickly and conveniently. Every Possible Way You Can. At a parking meter or want to be sure to move your car before the next hourly charge? Then just TIME IT. 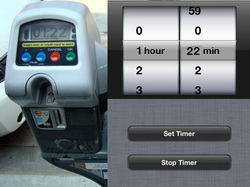 Conveniently set the timer to alert you to feed the meter or move your vehicle. Just think of all those parking tickets, towing and parking fees you'll save by using BOSTON LOCAL's Car Finder to TIME IT. Encourage every local and global visitor to your business to use this. They'll appreciate both the convenience and goodwill. They'll also remember your having 'looked out' for their well-being, their vehicle and their money. YOU get to take ALL the credit! Maybe you need to haul two or three vehicles of family, friends or even the team to dinner or to an event. Maybe you're out with family or friends and agree to rendezvous at your car or another car. Maybe even just to ensure that everyone in your party can conveniently locate your vehicle after the event or shopping trip. Or, to answer the question, "Where exactly are you?" when you're stuck, stranded or just need a ride. These are but a few of the reasons you'd be glad to be able to send your vehicle's precise GPS coordinates to others. It makes for an easy and safe way to DIRECT OTHERS TO IT using one's mobile device and the vehicle's GPS coordinates. The BOSTON LOCAL Car Finder gives you this ability and convenience 24x7 anywhere in the U.S. where internet access is available. Courtesy of The Boston Directory. Having a grand opening, launch party or other business or community event? Make it super easy for both local and global consumers to find their way to it. Send this e-mail out as part of your email blast or electronic invitation; or use this to acquire the precise GPS coordinates, then include it as part of your marketing. Ever return to your car in the parking lot or garage only to get the sudden feeling that every car looks exactly like yours? How about that 'chirp, chirp' you kept making only to find that it was the other person's 'chirp, chirp', experiencing the same 'feeling' as you, having actually helped yet a third person locate their vehicle? With the BOSTON LOCAL Car Finder, simply send your GPS coordinates to yourself before leaving your vehicle. Then, using your mobile device's GPS to conveniently FIND YOUR WAY BACK TO IT. Besides, it's not you that's lost... it's your vehicle that's lost. Right? Can't seem to locate your car? Not you! That's someone else's problem. Be The Hero! Show him (or her) how its done right using BOSTON LOCAL. 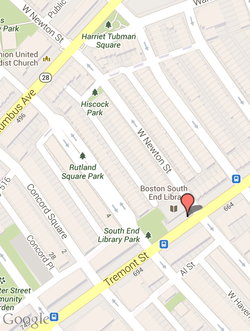 Boston Consumers Can Easily Locate You. Global Consumers Can Easily Locate You. Are You In... BOSTON LOCAL?